Nancy L. Newfield has been watching hummingbirds at her Louisiana home and lots of other places since 1975. Nancy lost her amateur status years ago, and now writes and lectures on hummers. She is co-author of Hummingbird Gardens, reviewed elsewhere on this site. 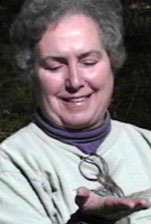 Nancy is also a licensed hummingbird bander and a recognized authority on hummingbird distribution, behavior, and taxonomy. The name of Fernando Ortiz-Crespo is well known to every serious student of hummingbirds. A native of Ecuador, he earned graduate degrees studying hummers at the University of California at Berkeley in the late 1970s. Fernando made important observational studies of the quantity of food a single bird might consume and he determined the sizes of the territories of a couple of species. Most importantly to those of us who band hummingbirds as part of our own studies, he developed a method for determining approximate age by looking for minute corrugations along the length of the bill. Adult hummers have smooth bills, with no corrugations. Youngsters just out of the nest may have the entire length of the bill covered with these tiny lengthwise wrinkles. The wrinkles begin disappearing soon after the youngsters fledge, but the process is not rapid. We use the percentage of corrugations along the length of the bill to tell us whether an individual bird is an adult or a youngster. I've learned that on 12 September 2001, our beloved Fernando drowned in a boating accident which claimed two other lives on Lake Micacocha high on Mount Antisana outside Quito, Ecuador. They were studying the birds of the lake. Van Remsen, listowner of Humnet and a close friend of Fernando, asked that we remember our friend when we look at a hummer. I seldom fail in that when I take a magnifying loupe in my hand to examine the corrugations on a hummer's bill to determine the age. He gave us that, but his legacy is so much more. Fernando's name appeared to me when I first began studying hummingbirds in the mid-1970s. I was intrigued by such an exotic-sounding name, but did not know anything about him. Still, I read and learned from his various hummer papers. He remained a mystery until the early days of Humnet in the mid-1990s, when we established a personal correspondence based on our many common interests. When Fernando learned that I planned to visit Ecuador in 1998, he suggested that we should meet to share our interests in person. I was thrilled at his invitation because, still awed by his vast knowledge, I was too timid to initiate such a suggestion. Rather naively, I asked if there was anything he might want me to bring from the United States for him. Little did I know that he was a sophisticated man-of-the-world who travelled widely and spoke several languages fluently. He named a few items that were difficult to obtain in South America and added that he really wanted some cuttings of salvias from my garden like Dennis Demcheck had mentioned on Humnet. Fernando assured me that there were no laws forbidding importation of plants into Ecuador. Obligingly, I started cuttings of Salvia guaranitica, Salvia elegans, Salvia regla, and Salvia mexicana. We also planned a day's birding after my tour finished. Fernando appeared at the Hotel Embassy shortly after my group arrived and we all enjoyed a late supper together. Several other Humnetters were with me. Two weeks later, after the tour was finished, Fernando called for me at the hotel. He had brought along another woman, a friend of the family. Marianela was visiting from the coastal province of Esmeraldas. She spoke no English and my ability in Spanish is minuscule. That proved to be no problem as Fernando carried on the conversation in both languages while negotiating the busy streets of Quito [I was somewhat relieved that it was not an automobile accident that took his life]. We visited a private reserve for Andean Condors on Mount Antisana, where Lake Micacocha is located. The elevation is quite high, over 12,000 feet, and temperatures were in the upper 30s. Marianela had not dressed warmly enough, so Fernando lent her his coat. Fernando said that this treeless habitat called paramo was the habitat of his childhood. He said he was most at home here. He was energized by the brisk climate. Marianela and I gasped for air and shivered. We followed him right through a herd of small wild horses, descendants of animals that had escaped from the conquistadores more than 400 years before. From the shore of the lake, he pointed out Silvery Grebes, Andean Teal, Andean Ducks, Yellow-billed Pintail, and Andean Coots. The placid lake was smooth as a mirror. On the shore, we spied a flock of 17 Black-faced Ibis. "Those are rare here," he told us. "I missed the Ecuadorian Hillstar during the tour," I mentioned to Fernando. He drove up to a dense patch of Chuquiragua, a spiny shrub with thistle-like, orange flowers. Within minutes, I was gazing upon a male Ecuadorian Hillstar, resplendent with his glittering cobalt-blue head and pristine white underparts. The large, husky hummer clung to the flowers with his muscular feet and he jabbed his bill deep into the blossoms rather than waste valuable energy hovering. It was a perfect moment! Fernando's expertise encompassed more than just birds. The plants of the paramo are as unique and interesting as the animals. Stopping the car, he showed me two species of low-growing gentian. One had blossoms of royal purple, the other vivid crimson. Nearing the condors' roost, I spied a large dark raptor soaring over the crest of a ridge. Quickly, Fernando identified it as a Black-chested Eagle. A second eagle appeared and Fernando put his scope on it. While were engrossed in watching the eagles, a condor approached over another ridge crest. Then a second and third condor soared across the deep blue sky. Through the scope, I could see the distinctive white neck ruff of the two adults. WOW!!! It was a perfect finale for a perfect day! It is a memory that will stay with me forever. Last August, my friend, Margaret Owens and I planned a very short vacation in Costa Rica and Ecuador. We wouldn't have much time in Quito, but Fernando was insistent that I visit his home to see my salvias growing in his garden. He said he would meet us at the plane and deliver us to the lodge offices after lunch. I can still see him leaning on the fence, waiting as we cleared the aduana at the airport. It was a cool, breezy day. The bright sun felt good after our flight from Costa Rica. It had been cold and clammy on the airplane. The garden was spacious. About a fourth of it was shaded by a huge Inga tree that Fernando said drew lots of hummers when it was covered with its white flowers. Hummer chatter drew our attention. It was a big, bold, and beautiful Sparkling Violet-ear, the most common of the two species that stayed there year-round. A tiny Western Emerald zipped in to filch sugar water from the feeder guarded by one of the big guys. A pair of Vermilion Flycatchers called from the Inga tree. Fernando proudly showed me the cuttings that had survived the change in climate. None were in flower, but he was proud to say that he had plants from my garden - and I was proud to say that we shared that connection. After lunch and meeting Fernando's wife Cecilia, daughter Veronica, and grandson Mateo, he drove us back into Quito. Our goodbyes were too rushed on the busy street outside the lodge offices. Little did I know that I would never see my Ecuadorian friend again. You can find a picture of the two of us in the Humnet Rogues' Gallery. I can only imagine how devasted Fernando's family must be. He had accomplished a lot in his lifetime and he will be dearly missed. I feel privileged to have known him. Fernando Ortiz-Crespo lived a very full life. It just wasn't long enough. We should all remember that we are not promised tomorrow. Fernando's ashes were scattered at Lake Micacocha, the place he loved so well - and the place that took his life. He will be there forever now.